Cloudy dissonance: These cumulus clouds above Oklahoma both shade the earth and make shadows brighter. The larger ones have a distinct cauliflower shape, providing even more opportunities for light to bounce off of them. RICHLAND, Wash. — Atmospheric scientists trying to pin down how clouds curb the amount of sunlight available to warm the earth have found that it depends on the wavelength of sunlight being measured. 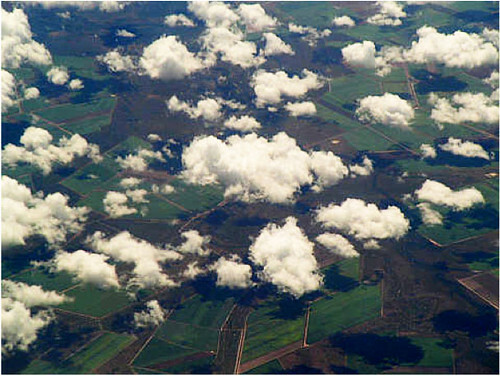 This unexpected result will help researchers improve how they portray clouds in climate models. Additionally, the researchers found that sunlight scattered by clouds — the reason why beachgoers can get sunburned on overcast days — is an important component of cloud contributions to the earth's energy balance. Capturing such contributions will increase the accuracy of climate models, the team from the Department of Energy's Pacific Northwest National Laboratory reported in Geophysical Research Letters earlier this month. "The amount of the sun's energy that reaches the earth's surface is the main driver of the earth's temperature. Clouds are one of the least understood aspects of climate change. They can block the sun, but light can also bounce off one cloud into another cloud's shadow and increase the solar energy hitting earth," said PNNL atmospheric scientist Evgueni Kassianov. Clouds both cool down and warm up the earth's surface. They cool the earth by reflecting some sunlight up into outer space, and they warm it by bouncing some sunlight down to the surface. Overall, most clouds have a net cooling effect, but atmospheric scientists need to accurately measure when they cool and warm to produce better climate models that incorporate clouds faithfully. But it's a hard number to get. Fair-weather clouds are big puffy white objects that bounce a lot of light around. They can make the sky around them look brighter when they're there, but they float about and reform constantly. Cloud droplets and aerosol particles in the sky — tiny bits of dirt and water in the air that cause haziness — scatter light in three dimensions, even into cloud shadows. To determine the net cloud effect, researchers need two numbers. First they need to measure the total amount of sunlight in a cloudy sky. Then they need to determine how bright that sky would be without the clouds, imagining that same sky to be blue and cloudless, when aerosols are in charge of a sky's brightness. The difference between those numbers is the net cloud effect. Researchers have traditionally estimated the net cloud effect by measuring a broad spectrum of sunlight that makes it to the earth's surface, from ultraviolet to infrared. But clouds are white — that's because the large water droplets within them scatter light of all colors almost equally in the visible spectrum, the part of the electromagnetic spectrum that includes the colors of the rainbow. On the other hand, aerosols — both within clouds and in the open sky — bounce different-colored light unequally. Broadband measurements that fail to distinguish color differences might be covering up important details, the researchers thought. Instead of taking one broadband measurement that covers everything from ultraviolet to infrared, Kassianov and crew wanted to determine how individual wavelengths contribute to the net cloud effect. To do so, the team used an instrument that can measure brightness at four different wavelengths of color — violet, green, orange, red — and two of infrared. In addition, this instrument, a spectral radiometer at DOE's Atmospheric Radiation Measurement Climate Research Facility located on the southern Great Plains in Oklahoma, allowed the team to calculate what the brightness would be if the day sported a cloudless, blue sky. The spectral measurements taken by the radiometer can be converted into the amount and properties of aerosols. Then aerosol properties can be used to calculate clear blue sky brightness. Comparing measured values for cloudy sky to the calculated values for clear sky, the researchers found that, on average, puffy fair-weather clouds cool down the earth's surface by several percent on a summer day. Although clouds cool overall, two components that the researchers looked at — from direct and scattered sunlight — had opposite effects. The direct component accounts for the shade provided by clouds and cools the earth. The second component accounts for the sunlight scattered between and under clouds, which makes the sky brighter, warming the earth. "The sunlight scattered by clouds can heat the surface," said Kassianov. "We all know that we can still get sunburned on cloudy days. This explains why." In the Oklahoma summer, the scattered-light effect measured by the researchers could be quite large. For example, if a cloud passed over the instrument, the measured cloudy sky brightness exceeded calculated clear sky value by up to 30 percent. Kassianov attributes that large difference to scattered sunlight being "caught on tape" by the radiometer. "Sunlight scattered by three-dimensional, irregular clouds is responsible for the observed large difference. The one-dimensional cloud simulations currently used in large-scale climate models don't capture this diffuse light," said Kassianov. The team also found that the effect changed depending on the measured visible-spectrum wavelength, and whether the light was direct or scattered. With direct light, the cooling caused by clouds was weakest on the violet end of the spectrum and strongest at infrared. With scattered light, warming caused by clouds was also weakest at violet and the strongest at infrared. Overall, the least cooling and warming occurred at violet, and the most cooling and warming occurred at infrared. Because large droplets in clouds scatter sunlight almost uniformly across the spectrum, the clouds themselves can't be the reason why different wavelengths contribute differently to the net cloud effect. Compared to cloud droplets, aerosols are more than 100 times smaller and scatter wavelengths differently. These results suggest that aerosols — which not only cause haziness but contribute to cloud formation as well — are responsible for the wavelength differences, something researchers need to be aware of as they study clouds in the sky. "If you want to study how aerosols and clouds interact," said Kassianov, "you need to look in the region of the spectrum where aerosol effects are significant. If you want to fish, you go where the fish are biting." Reference: Kassianov E., Barnard J., Berg L.K., Long C.N., and C. Flynn, Shortwave Spectral Radiative Forcing of Cumulus Clouds from Surface Observations, Geophys Res Lett, April 2, 2011, DOI 10.1029/2010GL046282. This work was supported by the U.S. Department of Energy Office of Science.